Hello! As the Crow Flies & Co is little home business in West Philadelphia run by Mike & Wilder Scott-Straight. Accidentally dropping a plate in the kitchen rarely leads to much more than a little broken glass and a lot of meticulous sweeping. But when Wilder found her favorite antique plate shattered on the floor, Mike brainstormed carefully on how to remedy the situation. He turned the plate's remnants into handmade pieces of jewelry and As the Crow Flies and Co came to life. A stained glass jeweler for over 20 years the idea came naturally. Now, the majority of Mike's time is spent scouring local secondhand stores and flea markets for unique plates he can put to use. They're one-of-a-kind adornments with a mysterious past, made to tell a new, miniature story. Wilder is the photographer, marketer and merchandiser who runs the shop and internet world. Follow us on Instagram and Pinterest to see more about us! 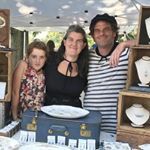 Here's a interview we did for the 30th St Craft Market a while back and a newer one for Art Star Craft Bazaar.